The volume of sales in 2017 is likely to get a lot closer than seemed possible to last year’s record-breaking volume. Investors are making up for lost time as 2017 comes to a close, buying and selling a high volume of student housing properties. “A gigantic inventory of student apartment investment sales were introduced to the market in the fourth quarter,” says Fred Pierce, president and CEO of Pierce Education Properties, an investor, developer and manager of student housing assets. After a slow beginning to the year, 2017 now seems likely to be one of the biggest years ever for sales of student housing properties. It’s unlikely to catch up to the record volumes of 2016, but might beat every other year on record. 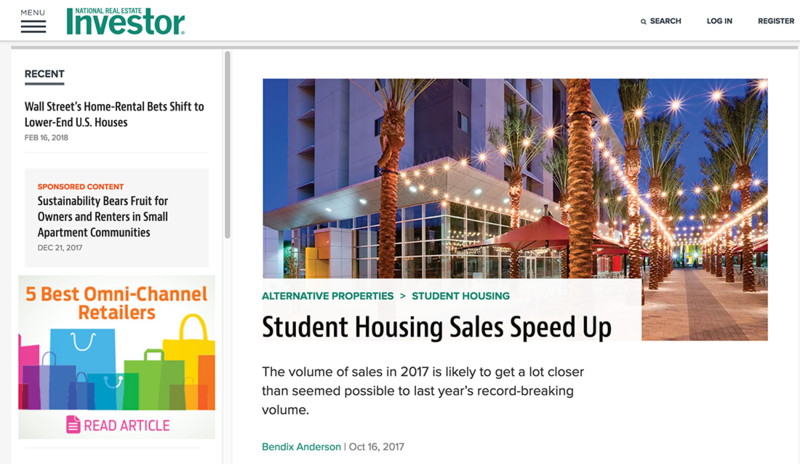 “I am very encouraged by the strong, deep investor demand for student housing properties,” says William Talbot, executive vice president and chief investment officer for American Campus Communities (ACC), which announced its own $591-million deal to buy a portfolio of seven student housing properties on Sept. 25. “Most believe that fourth quarter closings will bring total investment sales activity to $8 billion or more for 2017,” says Pierce. That would make the volume of investment sales in 2017 the second-largest in the history of the student housing sector, second only to the more than $10 billion in 2016. Buyers are finding plenty of available capital to help them close these transactions. “The trend of increase in global equity dedicating funds to the space continues… there is also available, attractive debt,” says Dorothy Jackman, executive managing director of the national student housing group at real estate services firm Colliers International. Also, potential buyers are finding ways to satisfy their requirements for investment yield, even though overall prices remain high and yields are still relatively thin. “We see more investors looking at tier-two and tier-three markets, recognizing the competition for tier-one properties may drive down cap rates and raise price points,” says Jackman. The giant deal by ACC shows the rush of deals now being completed and the struggle to find higher yields from acquisitions. “It is the biggest deal that has closed in the last 12 months,” says Jim Costello, senior vice president at Real Capital Analytics (RCA), a New York City-based research firm. ACC picked a set of seven strong properties for its giant deal with affiliates of Core Spaces and DRW Real Estate Investments. The portfolio also combines both the high prices and lower yields common for stabilized student housing with the higher yields that ACC receives from development. “Over the last few years, we have focused on development rather than acquisition. The yield is better on development,” says Talbot. The seven properties that ACC bought in the transaction includes four completed and stabilized student housing properties in which 97 percent of the beds are occupied. The others are still in the process of development and stabilization. ACC anticipates that in three years the yield on its investment will be more than 5 percent, once the properties have been completed and fully leased. That’s less than the 6.25 percent yield that ACC targets for its own ground-up developments. It’s also significantly higher than the usual yield of less than 5 percent now available from the acquisition of stabilized student housing properties.